Getting to the Northern Rivers of New South Wales and Gold Coast hinterland region of Queensland, Australia. Visitor information and travellers advice on getting here; airports, rail services, road links, and driving distances between towns in the Northern Rivers NSW and capital cities. Major destinations in the region include Byron Bay, Murwillumbah, Ballina, Brunwick Heads, Lismore and the twin towns of Tweed Heads in New South Wales (NSW) and Coolangatta on Queensland's Gold Coast, with the Gold Coast hinterland and Tamborine Mountain favourite places to visit for locals and visitors alike. Easy to get to and well served by plane, road and train services, the region is within 90 minutes drive of an international airport at Brisbane, the state capital of Queensland (QLD) , and just a hop (literally!) 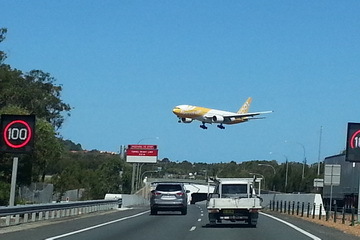 across the QLD/NSW state border from the Gold Coast Airport at Coolangatta. Please note: Airport codes are IATA designations unless otherwise shown. Brisbane International Airport - BNE: Brisbane Airport operates 24/7, with seven domestic carriers and 26 international airlines using the facilities. South and East Asian, Micronesian, South Pacific, and long haul carriers to Europe and Canada are prominent. It's an increasingly popular transit point for international visitors. Gold Coast Airport - OOL: Sometimes still called Coolangatta Airport, Gold Coast Airport is the southern gateway to Queensland and also serves the Northern Rivers New South Wales region, with daily flights from major metropolitan Australian cities, and international flights between selected cities in New Zealand, Japan, China, Thailand, Malaysia, Singapore, Vietnam and Indonesia. Sydney International Airport - SYD: The most popular point of entry for international visitors to Australia. The Northern Rivers NSW - Gold Coast QLD region is 90 minutes flight by domestic air services such as Virgin Australia, Jetstar, QANTAS, Regional Express (REX) and Tiger Airways, or ten to twelve hours drive. Daily airport transfer services operate between Brisbane International Airport, Gold Coast Airport, and Ballina/Byron Gateway Airport, with Airtrain connections available to Brisbane from Robina transit centre on the Gold Coast. Gold Coast Airport - OOL: The southern gateway to the Gold Coast and Queensland, and northern gateway to Northern New South Wales, with commercial daily flights from all major Australian cities and regular international flights between selected Asian and New Zealand cities. Tour operators, charter and private services also operate from here. Ballina/Byron Gateway Airport - BNK: is the southern access to the Northern Rivers NSW, with regular commercial flights to Sydney, Melbourne and Newcatle on Virgin Australia, Jetstar and Rex (Regional Express flights, along with light charter, private services and tour operators. Lismore Airport- LSY: Offers an alternative inland access to the Big Volcano region with commercial domestic airline passenger operator with REX, plus charter and private services only. Casino Airport - CSI: operational status unavailable. Kooralbyn Airfield: ICAO: YKBN; Sealed airstrip - light aircraft and private charter only. Murwillumbah Airfield - ICAO: YMUR; Grass airstrip - light aircraft, private charter, training, and tour operators only. Tourist shuttle services offer door to door, accommodation and set down transfers between Brisbane International Airport, Gold Coast Airport and Ballina/Byron Gateway Airport on a daily schedule. Local taxi and bus services maybe available to connect to inland towns, villages and hamlets. New South Wales State Rail Countrylink train services travel between Sydney and Brisbane via Casino, where you can transfer to coaches for Alstonville, Byron Bay, Lennox Head, Lismore, Murwillumbah and Tweed Heads, and the Gold Coast in QLD, to Robina transit centre (terminus for "Airtrain" services to Roma Street Station and the international airport in Brisbane) and to Surfers Paradise. National, regional and local coach operators providing daily services use the Pacific Highway (the nation's major east coast highway), with pickups and setdowns at all major regional towns, including Ballina, Byron Bay, Lismore and Murwillumbah. Extensive country transport services information is available for the region, including villages and small hamlets. The Pacific Highway is the major east coast road and second most travelled in the nation, starting from Sydney and passing through the region to the Gold Coast and Brisbane. A major by-pass of the highway has recently been completed for the Tweed and Brunswick valleys, resulting in many visitors unknowingly missing the spectacular views, natural attractions and the unique villages along the old highway, which is now called the "Brunswick Valley Way" and "Tweed Valley Way", where it passes through the towns of Brusnwick Heads and Murwillumbah, and smaller villages along the route. The Summerland Way provides an alternate inland route from Grafton via Casino and Kyogle, to Brisbane. There is a brief introduction to driving in Australia for international visitors, which maybe useful for first time travellers here. The region is well served by the major coach companies, with convenient stops at all major towns through-out the region. To get around the region by public transport, a visit to Country Transport Services Information maybe useful, although some locailty info isn't completely up to date. We have calculated the following popular driving destinations, in kilometres (conversion table here) so you can get an idea of how far each major town or city is in relation to others, with the state capitals of Sydney NSW and Brisbane QLD included. Important Note: This information should be used as a guide only. Driving distances will vary according to the route taken and roadworks/highway upgrades since publication. Pacific Highway and main arterial roads only are used, even though some alternate or secondary local routes maybe shorter. For accurate driving distances and driving times, a visit to the local Automobile Organistion in your state is advised, for current maps and information. STOP. REVIVE. STAY ALIVE; To avoid driver fatigue, stop and rest for at least 15 minutes every 2 hours or share the driving. Australia uses the metric system of measurement (although many people still use imperial measure in everyday speech). A kilometre is about 6/10ths of a mile. See also Driving Distances in Australia, between capital cities and major destinations, and a Driving Distance Conversion Table. The Big Volcano region (Green Cauldron) is a fantastic holiday destination for 5 -10 days, or longer. You can experince the cosmopolitan delights of our cities, resort towns, and our renowned beach culture, or dip into our country life and visit the "Australian Bush", world heritage rainforests and natural attractions, all in a day if that's your inclination. Alternatively, the region is a great stopover before flying home, or an excellent starting point to rest up and take it easy for a couple of days to recover from jet lag on arrival in Australia. International visitors can fly into Brisbane and fly or drive south if Sydney, the Blue Mountains and Melbourne, or west if South Australia and the "Red Centre", are the planned destinations. And if you've entered Australia via Sydney, you can fly (90 minutes) or drive north (12 hours) to this region, beforing travelling onto Fraser Island, Noosa, Port Douglas, Cape York and the Great Barrier Reef, before flying out of Brisbane or Cairns. YouTube video "EVERY LANDING IS AN ADVENTURE", Motorised glider landing at Tyagarah Airfield. Tony Meggs.